We gain creative inspirations through our wanderings so David and I regularly plan road trips to museums, exhibitions, gardens and other beautiful places. The Fuller Craft Museum in Brockton, MA is dedicated to contemporary crafts and a place we visit occasionally. Its problem is that it is located on the road to nowhere. On Saturday we decided to team up with daughter Karen and make the trek. There were several items in the exhibits the engendered the "Oooooh!" reaction from me. 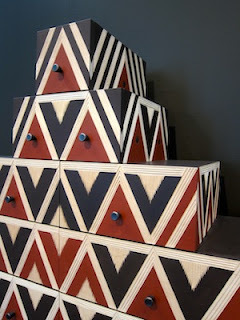 This piece in the Furniture Divas: Recent Work by Contemporary Makers exhibit caught my attention. I am often drawn to items with strong geometric patterns (not to mention beautiful storage) like this piece by Judy Kensley McKie. 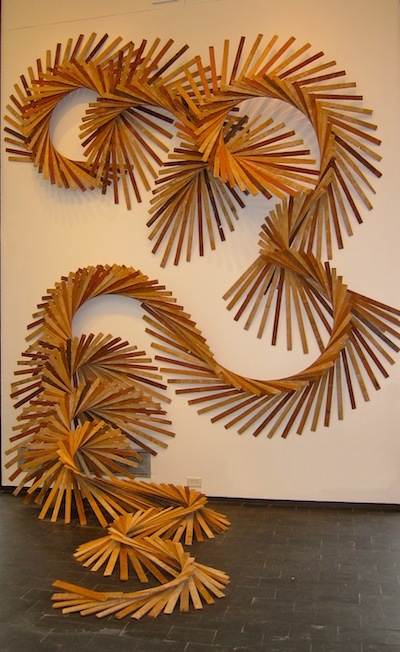 Below is a sculptural piece made out of old plaster lathe strips which also caught my attention. Geometry can often be so static in it's mathematical precision. Not so in this piece by Barbara Homes. It is very dynamic and fluid. In a second exhibition Loom and Lathe, I found this beautifully delicate basket, made from the skeletons of leaves and created by Kay Sekimachi. 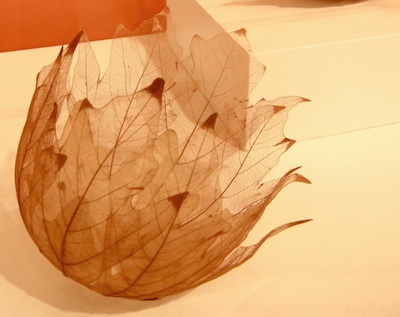 It is crafted from Krylon-coated maple leaves. Her work is shown in combination with that of her husband Bob Stocksdale. He is renowned in the field of wood turning and there were many exotic wooden bowls combining a stunning sense of shape with unbelievably thin walls. I have a growing collection of turned wooden bowls from lesser know artists. From a show like this I take inspiration. The work here is museum quality and not things I would ever be able to have in my home. But I have learned creativity breeds creativity. Going to exhibitions of this type gets the ideas flowing. A quick search on my iPad informed us that there was an IKEA nearby. We followed up the museum visit with a 2 hour inspiration gathering ramble through IKEA which is a great place to visit when the creative juices are pumped. I made some purchases which may very well show up in a future post as an IKEA hack!